The industrial sector's transition to Industrie 4.0 is much more than a question of technology. It will affect not only individual corporate strategy but also national economic and employment policy. 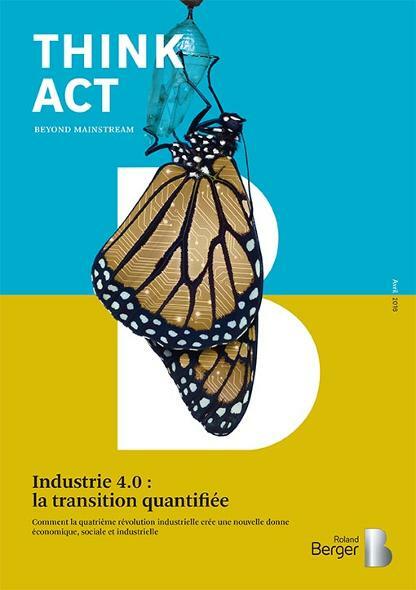 The consultancy Roland Berger has published a new study, "The Industrie 4.0 transition quantified – How the fourth industrial revolution is reshuffling the economic, social and industrial model", which lays out how these effects can be visualized. The key is to look at the return on capital employed (ROCE) in the manufacturing sector. The approach shows how Industrie 4.0 can help improve profitability and ROCE simultaneously and highlights the resulting effects on companies, nations and employment. "Industrie 4.0 must not be confused with automation. While the latter does also make production processes more efficient, it can only do so by tying up huge amounts of capital," said Max Blanchet, Partner at Roland Berger. "The fourth industrial revolution is what makes efficient capital employment possible." The Roland Berger experts looked at the example of an automotive supplier and calculated that transforming its production facilities into Industrie 4.0 operations could improve the company's ROCE by 25 percentage points to 40 percent. The transition could also potentially improve machine productivity from 65 percent to 90 percent. Experience more about Industrie 4.0 in our summary of the publication. Keen to bring these effects to bear for the benefit of the economy as a whole, many countries have launched political initiatives to help national companies evolve their manufacturing facilities toward Industrie 4.0. Here, for example, Industrie 4.0 places the digitization of production right at the top of the political agenda. And rightly so, Germany being the only country in the world to have seen its ROCE improve over the past 15 years, not least thanks to its consistent promotion of Industrie 4.0. With no change in the rate of asset turnover, ROCE increased from 12 percent in 2000 to more than 30 percent in 2014. France's industrial enterprises have been struggling with an ageing machine base, job losses and falling profitability for years. A 40 billion euro shortfall in investments in 2014 caused the national ROCE to fall to 8 percent (from 20 percent in 2000). The digitization of production in France will enable the nation's industrial sector to return to a growth path and bring manufacturing operations that had once been offshored back into the country. This will create new jobs and make industrial enterprises attractive places to work again. US companies already relocated their production facilities years ago, mostly to low-cost countries like Mexico and China, in the process hemorrhaging more than five million jobs in America between 2000 and 2014. Though investments have doubled and higher automation helped profits jump 54 percent in the same period, ROCE has not improved because the nation's industrial enterprises failed to make efficient use of their machine base. The current government is keen to reverse this trend with policies such as the Advanced Manufacturing Partnership in a bid to become more competitive. Japanese industry saw profits fall by 80 percent between 2010 and 2014 and two million jobs destroyed. The strong yen, which has dragged down exports, has exacerbated the country's deindustrialization. The Japanese government is now following Germany's example in focusing strongly on Industrie 4.0 in a bid to give a renewed boost to the industrial sector and jobs in the country. China, known for cheap mass production, needs a paradigm shift if its industrial sector is to remain globally competitive. Falling demand for low-cost products coupled with rising wages and energy costs is a scenario that China's industrial enterprises cannot survive. So the government has launched an Intelligent Manufacturing 2025 initiative to turn the tide in a bid to upscale and become known for high-quality products. Despite the higher efficiency of factories of the future, there is still a risk of job losses, especially among less skilled workers. The Roland Berger experts modeled the change in the number of jobs in Western Europe that would result from Industrie 4.0. The assumption was that half of all industrial enterprises would have fully converted to digital manufacturing. The results showed that while some jobs would indeed be lost, advanced manufacturing would also create new roles for people, and thus new jobs. "Industrie 4.0 has the potential to create as many as 10 million additional jobs in Western Europe, which leads to a positive balance overall," commented Thomas Rinn, Head of the Global Engineered Products & High Tech Competence Center at Roland Berger. This is because smart, digitally connected systems and process chains tie up less capital and therefore lead to an improved ROCE. "We anticipate a rise in ROCE in Western Europe from today's 18 percent to 28 percent in 2035 thanks to the possibilities offered by Industrie 4.0," said Thomas Rinn. "This can bring 420 billion euros in added value from higher profits and lower capital employed." Production methods and modes of working will be very different in the future, and this is going to change business models and a lot of job profiles as a result. New types of jobs will be created, particularly in the service and IT sector – and companies will need more workers who, in turn, will need to be well qualified. "The trend toward the sharing economy will give rise to a great many new providers in business areas such as education, healthcare and mobility," explained Max Blanchet. Roland Berger estimates that some seven million new jobs will be added to the labor market in services and IT alone. "The digital transformation has already begun. If we don't want to be left with a vacuum, industrial enterprises already need to be gearing up for the changes to be wrought by Industrie 4.0 and working on their digitization strategy," said Thomas Rinn in summary.